Many clients ask the question, “Do I need a Will?” The answer is an unqualified YES, ABSOLUTELY, WITHOUT A DOUBT. In fact, everyone walking the face of the earth that has assets, no matter how modest, needs a properly drafted and valid Will. There are numerous reasons that every adult should have a properly drafted Will, and this article addresses one of the primary reasons – transfer of ownership and title to assets on death. Many clients have told me of their mistaken belief that ownership of assets will transfer upon death to the intended beneficiary, with no legal process, as if by magic. This belief is fostered by the fact that some assets contain beneficiary designations or survivorship clauses or payable upon death designations and transfer outside of the provisions of a Will. But, not all assets have such provisions and those distributions should be addressed by a properly drafted Will. Assets which do not contain any legally enforceable beneficiary designation pass through the estate of a deceased person to the heirs at law. The heirs at law will be determined by the provisions of the deceased party’s Will, or in the absence of a valid Will, by the laws of the State having proper jurisdiction. Many times clients have an expectation of what those State laws will be, but in many instances the State law is much different than the client expects. For example, in Alabama, the law of intestate succession (the law that applies when no Will is probated) provides that upon the death of married person who is survived by a spouse and living children, the estate is distributed with the spouse receiving $50,000 plus ½ of the remainder of the estate and the remaining ½ of the estate is distributed to the children. This is NOT the result that most married couples intend upon the death of a spouse. A properly drafted Will assures that the directions of a party, as to distribution of assets on death, will be followed as stated, and intended, by the maker of the Will. Another common issue that is questioned by clients is the need for Probate proceedings. Probate is the legal process through the Probate Court by which the Will of a deceased person is recognized by the Court as the true last Will and testament of the deceased party. It is this process, and the Orders of Court, by which the distributions stated in the Will are given legal significance. 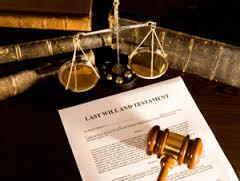 A Will means nothing and has no legal significance without Probate. Probate is a process that should not be feared. In Alabama, it is not unnecessarily cumbersome or overly expensive. That brings us to the question, “Do I need an attorney to prepare a Will or to Probate a Will.” There is no law that requires a person to have an attorney assist with the preparation of a Will or to represent a party in the Probate process. However, the practical answer is most people do retain the services of a competent attorney in both instances. A properly drafted Will assures that the family is able to effectively accomplish transfer of assets on death of a family member with a minimum of difficulty and expense. The services of an attorney in navigating the Probate process assures the family of an efficient process in dealing with the issues of assets, taxes and debts upon the death of loved one at a very emotional and stressful time.